18 FT X 25 FT. - This majestic suite offers private access to the beautiful grounds where you can find peace and solitude in the rock garden. 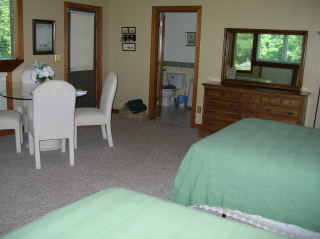 The suite offers 2 queen sized beds, a charming twin bed, sitting area and lovely bath with Jacuzzi Tub. 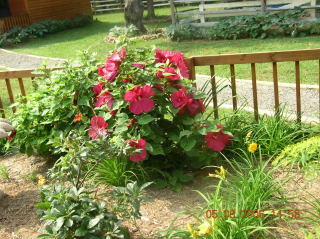 Rates: $140.00 Plus Tax - 2 guests, $25.00 Plus Tax each additional guest. $50 NON-REFUNDABLE DEPOSIT REQUIRED AND APPLIED TO ROOM CHARGE. 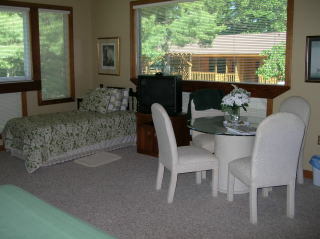 VIEW OF TWIN BED AND SEATING FOR 4 IN MOUNTAIN HOLIDAY. TWO QUEEN BEDS AND 1 TWIN BED ARE AVAILABLE IN THIS BEAUTIFUL SUITE. ALSO, A TABLE AND 4 CHAIRS ARE INCLUDED FOR YOUR CONVENIENCE. 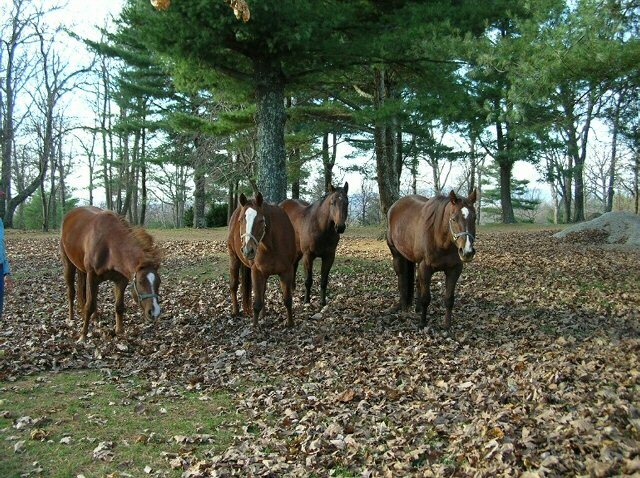 VIEW OF HORSES FROM DECK OF MOUNTAIN HOLIDAY SUITE. 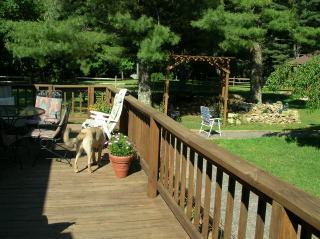 VIEW OF ROCK GARDEN FROM MOUNTAIN HOLIDAY DECK.